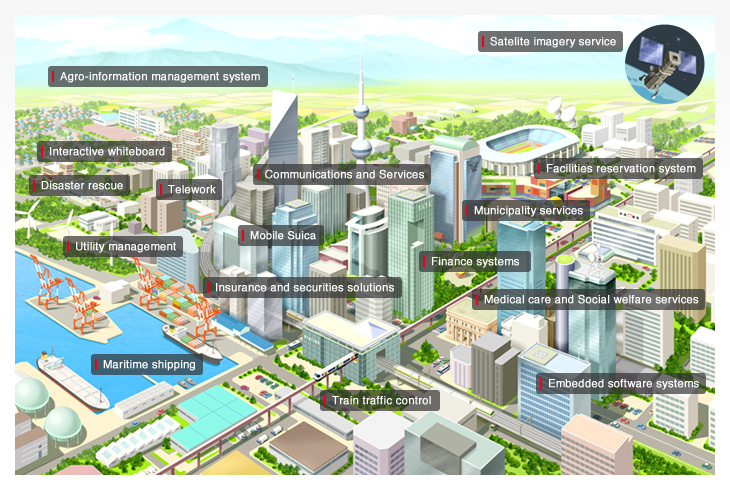 Hitachi Solutions is committed to providing the global community with solutions that contribute to safety and amenity in our daily lives. Our goals is to be a solution provider that has a positive social impact through IT services that help to resolve the diverse challenges facing society and corporations. We will help create financial markets that offer sound reliability and contribute to a greater diversity of services, by developing an environment that enables secure online banking from homes and corporations, and building frameworks to enable secure, accessible, and reliable financial transactions for everyone. We will offer comprehensive solutions that cover every aspect from logistics through to procurement and marketing, and help build an environment that benefits both consumers and logistics users such as retailers. We will help to enhance the development capabilities of the Japanese manufacturing sector and contribute to its overall optimization, by offering systems that enhance process efficiency and solutions that seamlessly manage all processes in manufacturing. We will support agriculture for the next generation, with the aim of securing stable yields of safe and high quality products, through geographical analysis utilizing satellite graphic images. We will support IT that improves patient services, and enhance the financial viability of hospitals and social facilities, while helping to secure medical and social welfare services that are safe, secure, and affordable. We will help to enhance government and school services and contribute to community revitalization, through security solutions and solutions that improve work efficiency. We are also proposing solutions that incorporate IT into education, such as electronic whiteboard solutions. We will contribute to IT systems for disaster response, through the provision of satellite imagery that enables an accurate assessment of conditions at disaster sites. We will contribute to improving the efficiency of port operations through cargo management systems that utilize radio frequency identification (RFID) and other technologies, as well as contribute to improvements that enhance transport efficiency and precision. We will support everyday train service and energy distribution through systems that offer high reliability for mission critical operations. We will also offer green IT solutions to support the transition to a low-carbon society. We will help to develop work approaches that offer amenity and efficiency such as through business improvement. We will also help individual workers to clarify their career plans and enhance their individual skills through human resources development. We will support development in various areas including car navigation, digital television, Blu-ray technology, and mobile phones, by leveraging cutting edge embedded technologies to assist the early market launch of products with advanced features.